Planning a wedding is a big endeavor. There are many costs associated with the big day. Traditionally, the bride's parents have paid for the majority of expenses for the big celebration. But, times and circumstances have changed. 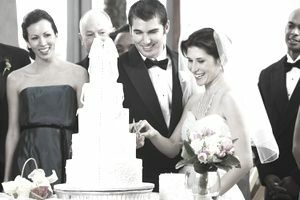 Today, the two families will often split wedding costs and planning responsibilities. In many cases, the bride and groom will even take on many of the costs themselves, particularly if they are older and have established careers or this is not their first marriage. In some cases, the bride and groom are earning more money than their parents, who may be on a fixed income or planning for retirement, so for older couples to absorb some of the cost themselves makes sense. With the rise of Pinterest as a go-to for planning a wedding, brides, and grooms can become starry-eyed at the ideas they find, from little things like a wedding soundtrack for each guest on a jump drive to big things like individual desserts for each guest. The average cost of a wedding now $26,000 (remember, that's average! ), and breaking the bank is easy if too many things that are optional become required. Another popular trend among engaged couples is a destination wedding, which adds a lot of expense to not only the parents but to all the wedding guests, who will need to pay for transportation and lodging in most cases. Though weddings are filled with tradition, paying for it is the one aspect that has changed, and with good reason. Parents of the bride can be thankful because this relieves them of the obligation to cover most of the cost. Sure, many parents are willing to fork out a pretty penny for their little girl, but somehow it just doesn't seem fair for that to be assumed. The traditional wedding split has very fine lines of who pays for what. This method was used for generations of Americans and was an unwritten rule in wedding planning. Let's take a look at the traditional breakdown of wedding costs. All stationery-related items, including wedding invitations, save-the-date cards, programs, and place cards. Bouquets for the bridal party and flowers for the wedding and reception. Gifts for the bride's attendants. The wedding reception, including caterer, bar, music, favors and both the wedding and reception venue. The engagement and wedding rings. The minister or rabbi fee. Gifts for the groom's attendants. Boutonnieres for the groomsmen and attendants. Some wedding consultants suggest that the groom's family also pay for the bride's flowers and the corsages for the mothers and grandmothers. There are always circumstances that should be considered when splitting the cost of a wedding. If one family is more affluent than the other or someone is struggling through hard times, it would be considerate to make allowances or cut costs. A wedding is, in reality, a luxury item, and no one should be expected to spend more than they can for a DJ, cocktails, and dinner. The overall cost of weddings has skyrocketed in the last decade. It is important for every wedding to have a budget that everyone can agree with. If paying for any of the latest and greatest wedding features becomes a challenge, then it may be best to leave them out or downsize. Sending either family into debt over one day is not a good way to start a new life together. Remember that it is not just the bride and groom who are joining, but their families will be sharing life moments as well. It is best to start on good terms!